3.5 starsFull review can be found at Paper Riot!I read this first installment in the Gemma Doyle series when I was sixteen (I think) and damn, it scared the hell out of me. But I was also really intrigued. 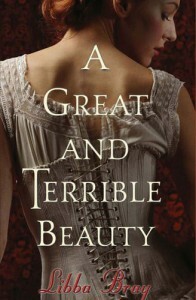 A Great and Terrible Beauty was a story unlike anything I'd ever read before, and now, a few years later, I still haven't read anything like it.This book completely crosses the lines between different genres, and in a brilliant way! The history freak in me loved the Victorian aspects of this book (the fancy language, the many different habits and of course all those gorgeous dresses!) along with everything I didn't expect to find in historical fiction. The finishing school Gemma attends was exactly what I'd thought it would be: a school to teach girls how to be perfect wives and hostesses.What I didn't think I'd find was the way I could relate to it in a modern way: there was lots of gossiping and bullying. 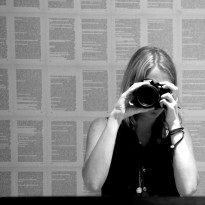 Hello, chick lit aspects! Libba Bray captured these teenage girls perfectly in their exploration of sexuality (behind closed doors, of course). And finally the creepy visions and 'higher' world ensure the paranormal/fantasy thing. Like I said, a mix.But where I loved the set-up, I wasn't that fond of the characters. I enjoyed reading the story from Gemma's point of view: the outside girl who doesn't really belong in any world she visits. She was an easily likeable character, but her friends? Not so much. Felicity, Pippa and Ann seemed superficial and snobby and I just couldn't relate to them. Something that I think essential in reading a book.Their friendship with Gemma wasn't well-founded, which made me care for them even less. The only thing that tied these girls together was Gemma's secret, and I was a bit irritated that the others took part in that as if it were their own. That's what disliking someone tends to do to me.The only character, apart from Gemma, that interested me was Kartik, the dark, mysterious, dangerous, quiet stalker? guy that followed her from India (to protect her? To kill her? To warn her? I don't even remember why). There was a lot of mystery behind that part of the story. I really enjoyed reading about the gypsies, and I would've loved to have gotten a little more out of that part.But even though I didn't like most of the characters, Gemma's visions and the abilities she discovers are so intriguing! Mary's diary, the seemingly perfect 'other' world, the disastrous turn of events... there were enough twists and turns to keep me interested, and such beautiful worlds I felt myself being drawn in a little more with every chapter.I loved the historical aspects along with the beautiful and vivid surroundings (colonial India, Victorian England and the paranormal Realms). Though the last one made me feel a little paranoid. While the girls were off dancing and jumping around, I was always waiting for things to get out of hand.The story was well-paced (not really fast, but fast enough to keep me going, even though some parts gave me the creeps).It's funny, writing this review as least three years after I've read the book and still being able to remember it so vividly. I enjoyed reading this story, I really did. However, I never felt the characters were fully developed and I didn't like them enough to love this book. Character development is so important to me, and I just didn't care for most of them enough.Memorable quotes"I will tell you the story of how we found ourselves in a realm where dreams are formed, destiny is chosen, and magic is as real as a handprint in the snow. ""I don't know yet what power feels like. But this is surely what it looks like, and I think I'm beginning to understand why those ancient women had to hide in caves. Why our parents and suitors want us to behave properly and predictably. It's not that they want to protect us; it's that they fear us. ""I know because I read. Might I suggest you try it?"